Type approval was introduced for towbars on cars registered from 1 August 1998 in Great Britain (20 April 1999 in Northern Ireland). It moderised the industry and along the way some companies went out of business or had to stop making towbars for cars. By 2012 type approval had been extended to cover vans, chassis cabs and pickups. This also included motorhomes which for the first time now require type approved towbars. - Mounting to the vehicle manufactures specified towbar mounting points only. It is not possible to mount the towbar in additional places. - Before the towbar can be approved it must be placed on a rig to complete a two million cycle fatigue test which is witnessed by the appropriate authority. In the UK this is the Vehicle Certification Agency (VCA), part of the Department for Transport. - The standards also specify the dimensions, locations and clearance of the 50mm towball. ECE (United Nations Economic Commission for Europe) Regulation 55 has now replaced the EC directive. This has all the requirements of EC 94/20 along with some extra requirements, the most important difference being that it also requires a test on the secondary coupling, which is what a breakaway cable connects to on braked trailers. Towbars to EC 94/20 are still suitable for sale, fitment and use. The main types of vehicles that do not require type approved towbars are vehicles that are imported from outside the EU ("grey imports") and vehicles that where registered before type approval became law. So for example a 1993 Mazda Bongo imported from Japan does not require a type approved towbar because it is a grey import. A 1997 Renault Laguna does require a type approved towbar because it was registered before the type approval date. These vehicles will have a towing weight of zero kg and no specificed towbar mounting points. One some of these vehicles you may be able to fit a towbar tjust for mounting a cycle carrier (or load carrier). One many vehicles however the towbar manufacuters have not confirmed that the towbar will fit. This VIN (or chassis) plate from a Vauxhall shows four weights. 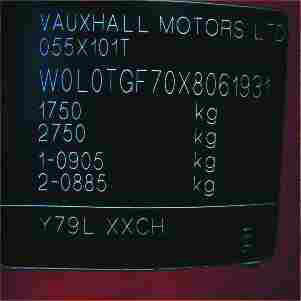 1750kg is the Gross Vehicle Weight (GVW) also called the Maximum Authorised Mass (MAM) [The maxmium vehicle weight]. 2750kg is the Gross Train Weight (GTW) also called the Gross Combnation Weight [The vehicle plus trailer]. 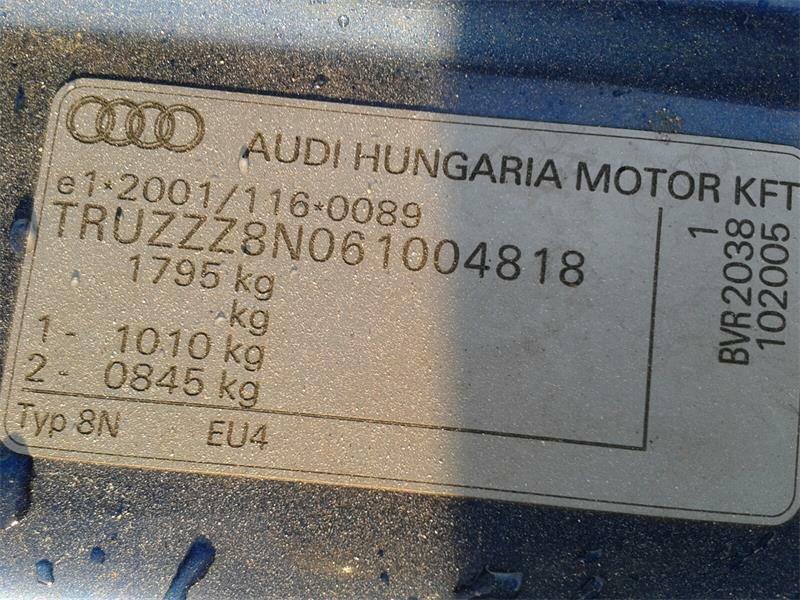 This plate is from an Audi TT which is not approved for towing. Vehicles that are not approved for towing will have the same weight twice (so that the towing weight is zero) or display zeros, dashes or (as in this example) a blank space for the maximum train weight.